These free sessions will be held at 1:00pm and lunch will be provided beginning at 12:15pm with a kosher option available. All high school students are invited to attend the sessions. All materials will be provided. If you're a student interested in registering, email us with your first and last name and we will add you to the roster. 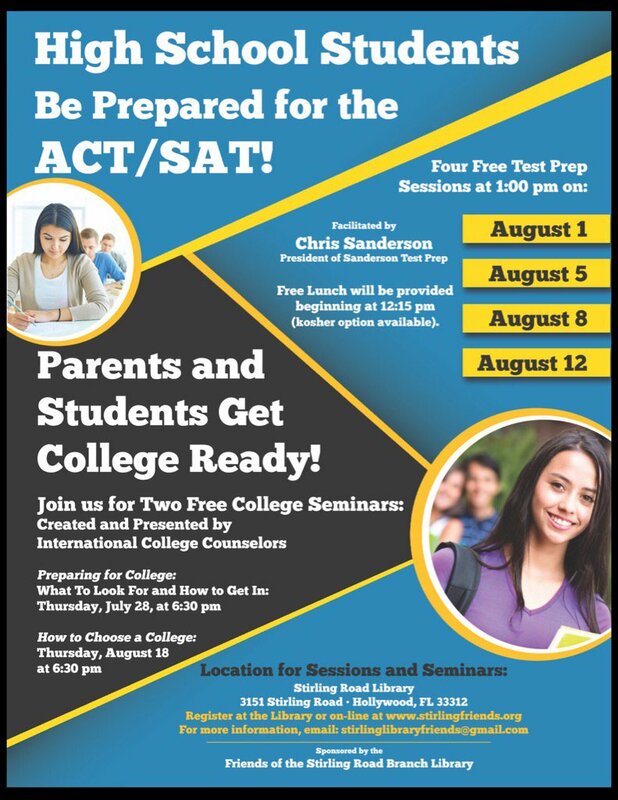 Additionally, we will be hosting two FREE College Preparation Seminars for students and parents led by International College Counselors. Preparing for College: What to Look For and How to Get In! Competition for acceptance to colleges and universities is at an all-time high. 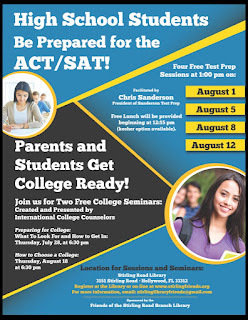 Parents and students in the 8th -12th grades are invited to attend a special, free seminar by the expert college advisor of International College Counselors that will provide real and practical answers to crucial questions about what you need to know about how to prepare for the college admissions process. What should my student do now to prepare for college? How can my student get into the college of his or her choice? How early should my child start the college admission process? What should my student look for when choosing a college? Choosing a college is one of the toughest choices high school students will have to make. Parents and students in the 8th-12th grades are invited to attend a special, free seminar by the expert advisors at International College Counselors where they will discover how to narrow the thousands of options including Florida colleges, private schools, and public out-of-state colleges, and choose a school that suits your own needs and goals. Also understand the role grades, standardized tests, course load, and extracurricular activities play in order for student to get into the college of their choice.